Last semester was yet another intensive time, in more ways than one. Although I was only doing 1½ subjects, which left people with a confused look when I told them. I guess it was like telling them I boarded the train from platform 9¾. The 2 subjects I was doing were Romans (in Greek) and Intermediate Greek. Intermediate Greek taught us how to use our editions of the Greek New Testament, and, well, basically to remind us of everything we learned last year and had since forgotten. As well as looking at how the Greek works after having been reminded of the basics. But the only assessment required was turning up. This allowed much more time and effort to be given to Romans. Now, if you’ve ever studied Romans as part of a Church Bible study group, or simply read through it, you know something of the juggernaut that the letter is. So imagine studying it from the original language it was written in – Greek. Are you starting to feel the intensity? I sure did! We were given a choice of questions for the main assessment, and I picked the place of [Old Testament] law in the life of a Christian being answered from Romans 7. I picked this question because the issue was brought to my attention last year, and I wanted to be much more clued up to form my position. So for me, this wasn’t simply an academic exercise in ticking a box. I worked very hard at understanding not just the issues in Romans, but the issues more broadly. By the time I had done all my research, my head felt like it was stuffed with cotton-wool, and I really struggled to write the essay. But, I managed to squeeze it out, and my essay was well received. Unfortunately, I’m reluctant to share it around. The essay looks like it was written by someone who swallowed a Greek New Testament, along with a few Greek dictionaries – and I’m not sure that I didn’t! I’d have to write a much more pastoral work before I distribute any of my conclusions. Occasionally, I’m reminded by friends what a privilege it is to study God’s word at Bible College. Such reminders seem to come when I’m stressed, or recovering from being stressed. So I tend to respond with a silent grumble. But I can honestly say, even at the heights of the stress, it was an absolute privilege. I rarely give unqualified statements, but anyone who says studying Greek is a waste of time is WRONG! I really thank God for my stubbornness in not heeding the advice not to do Greek, and the determination to keep going with it. I was able to draw our so much more from Romans. I don’t want to discourage people from reading their English translations. Everything you need for salvation is made clear in English. There is no secret knowledge to be had in reading Greek. But being able to read Greek helps me understand even more what I’ve come to know from the English translations. It wasn’t only studies that made the semester intense, but physical activity as well. 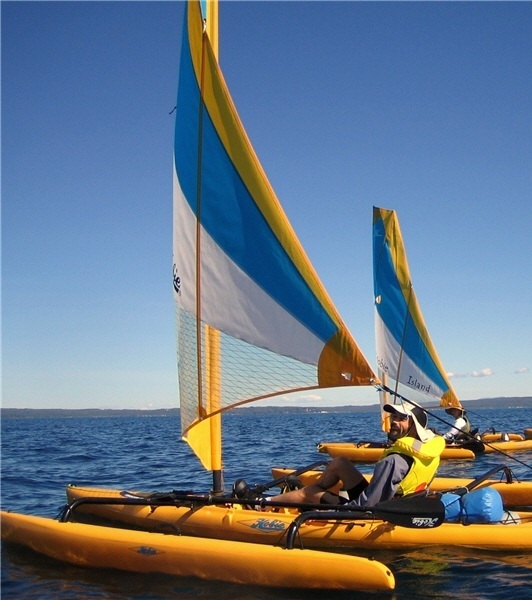 I was invited to go sailing for the beginning of May at Jervis Bay. I jumped at the chance, but quickly thought, “I know what an afternoon of sailing does to me. What’s a whole weekend of sailing going to do to me?? ?” So I was quickly back on my bike in the weeks leading up to the trip to get my fitness back up. This was just as well! There wasn’t much wind the whole weekend, so lots of peddling was done (remembering these boats can be sailed, peddled, or paddled). While returning to camping on the Saturday I was treated by a pod of dolphins, porpoising right next to my boat. I hadn’t seen wild dolphins before. I could have just about reached out and touched them. It was and amazing experience. Happily I got through the weekend without any sign of exhaustion. The services at the Spastic Centre are continuing. Though it’s becoming increasingly evident that this is an aged ministry, and not just a disabled ministry. Often we have had to pray for members who are quite sick, or dying. Even still, glimpses of extraordinary faith can be seen at these times, and these are such a powerful testimony to the grace and work of God in their life. I attended the funeral of one such man. Although Paul was not a full-time resident of Venee Burges house, he was there when recovering from operations, and was determined not to miss out on a church service – even in his last week. His funeral was none I had experience before. It was more a time of celebration than one of mourning. Paul was confined to a wheelchair, and had no speech, and very little use of his body. Yet, this man was able to have such an impact on people’s lives for the gospel, and had a great influence on his church, simply because he exercised his faith, and refused to let his disability to get in the way of anything! This was a great encouragement to me to keep persevering, and to see my disability as an opportunity, not as an obstacle, to minister. Unfortunately, many have considered my disability as the latter, much to my discouragement. So hearing of Paul’s life and faith was a great blessing. It is also a reminder what a privilege it is to be able to teach the Bible in this place, that people may hear and respond to the grace of God. I was also given the opportunity to speak on college mission. This time at Forster. I was to speak at a youth discipleship group, and to give my testimony (that is, how and why I became a Christian) at a men’s breakfast. I don’t pretend for a second that I’m easy to listen to. Even still, both talks were well received. Especially at the men’s breakfast where my message had a big impact as I found out later. The worst part about mission was not being able to go sailing. Anyone who’s been to Forster knows the water is a clear, light blue colour. I considered it a great injustice to be forced to drive past the water each day, beckoning me to sail it when I couldn’t. It left me exclaiming, “I WANT MY BOAT!! !” Which of course really isn’t my boat. I did get out on the water thanks to Jason Summers, which was an interesting experience doing a precarious balancing act with 3 other grown men in a tiny dingy. But it was fun! Well, looking at the college timetable to choose my subjects these days is like arriving late for a party only to pick at the scraps of food left over. That can only mean I’m getting closer to the end of course. Next semester I’ll be studying more Greek looking at the letters of Hebrews and 1 & 2 Corinthians – a man can never have too much Greek! But when I’ll actually finish is still uncertain. Somehow, I’m still intent on studying Hebrew! It also means my anxiety is increasing concerning future ministry. I keep praying for opportunity, and I have such an opportunity at present. So I am also praying that this will lead to other opportunities. I ask you would do the same.